Or again on April 13, 2016, ( 2-4pm ET; 1-3pm CT; 11am – 1pm PT we invite you to this free event to hear how the Community Septic System Owners Guide Tool was developed and see an interactive demonstration of the web interface. Many onsite wastewater systems serve clusters of homes through a shared ‘community’ system which obviously requires additional management. Delivering proper system management is key to ensuring cost-effective and long-term wastewater treatment for both new development and existing communities. The University of Minnesota’s Onsite Sewage Treatment Program and its national partners (including WasteWater Education 501c3) received a NIFA grant to develop a customizable Community System Owner’s Guide (CSOG) which can be developed using a web browser. Any individual can produce an expert-driven and locally-customized manual (electronic or hard-copy) CSOG for any cluster septic system in America. 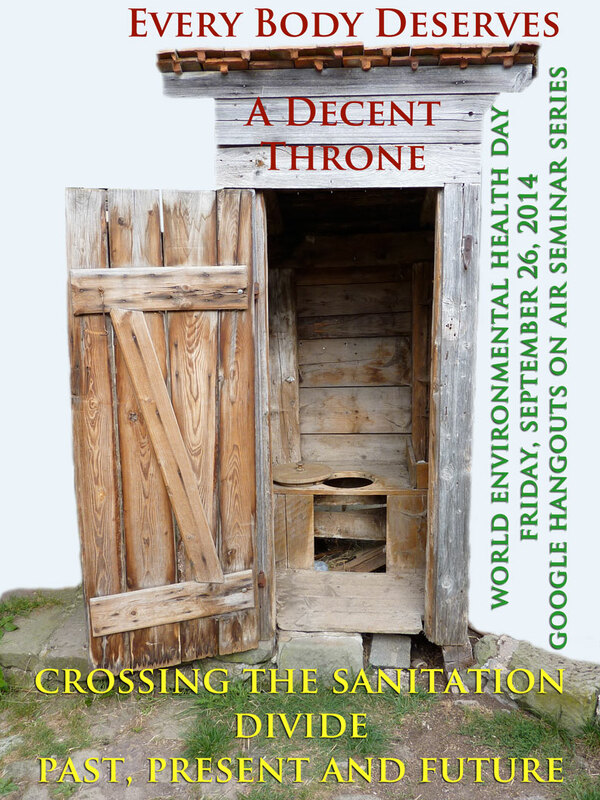 Crossing the Sanitation Divide – Past, Present and Future. Six session seminar series provided at no charge through Google Hangouts On Air. Dendra Best will look at the history of sanitation in the US and how that has shaped the technology of infrastructure ever since. Patrick Lucey – why traditional infrastructure is now unsustainable. His bio can be found at the aqua-tex.ca web site. Patrick Lucey – successful case studies of sustainable integrated water systems from Canada and the US. Patrick Lucey. A better future: how to export 21st. century knowledge not 19th century thinking. If the problem is massive, is this the time to rethink how we provide basic sanitation and clean drinking water systems both here in the West and in developing countries? The environmental, weather and financial climate is a whole new ball game from when most of these technologies were the norm. What kind of legacy are we creating for our children or grandchildren if we keep on doing the same thing? CollaborativeWaterSolutions.com Team – relevance to both small rural communities in CA and the US as well as Haiti, Africa and S. America. Culture, demographics, access to support structures and expertise – all play a vital role in ensuring whatever is proposed as the ‘ideal’ solution will actually be feasible AND workable in the long run. So often planning is something that is done TO a community not WITH it. Collaborative Water Solutions was created to build on the stellar work done by Water Environment Research Foundation where a team developed the Small Community Decision Making Tool to help local leaders determine their own best options for wastewater service. Helping Cleveland Communities | Science. Turning a vacant lot into a rain garden.